Bike stations are slated to open in San Francisco, Oakland, Berkeley, Emeryville, and San Jose. A vast new bike-share system debuted this past Tuesday in the Bay Area, with some 1,500 bicycles set to be deployed during the next eight weeks. But the Ford Motor Co.-funded program has overlooked one community very much in need of affordable transportation options: Deep East Oakland. With more than 120 locations set to open in the East Bay alone, planned stations span from north Berkeley and the UC campus to downtown and west Oakland and even a few stops in Fruitvale — but none east of High Street. Baybe Champ, founder of Oakland’s Original Scraper Bike Team advocacy group, told the Express that it’s a half-hour commute by foot from his Deep East home to the nearest BART station. He said he would use one of the new rental bikes if a station was nearby — but it would take more than a half-hour to walk to the nearest bike-share stop, he explained. “That’s not equal,” Champ said. 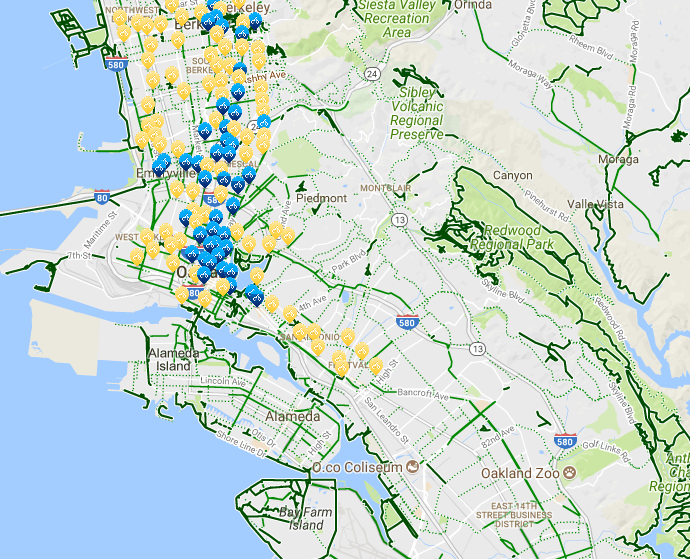 A station map at FordGoBike.com show dozens of stops throughout the East Bay flatlands, from Berkeley to the Fruitvale, but none in Deep East Oakland. According to Oakland transportation planner Carlos Hernandez, stations were selected during a two-year process, and sites were chosen based on criteria such as proximity to community jobs, services, and transportation points. The focus, Hernandez explained, is currently on the city’s downtown, where many residents commute for work. Dani Simons, communications director for Motivate, which operates the Bay Area bike share and eight others nationwide, said that the community-outreach process was particularly robust, including some 350 meetings with community leaders. These meetings proved useful last year, when the program first announced that memberships would cost $149 annually. Community activists pushed back, so transportation-advocacy groups TransFormCA and Cycles for Change stepped in to create a deal for low-income users, now just $5 a year. Champ and the Original Scraper Bike Team — which works with East Oakland youth to repair, build, and customize bikes for alternate forms of transportation — has participated in community events with Motivate and even promoted the bike-share program. And Champ said they’re being asked to be Ford GoBike “ambassadors” — even though there isn’t a station in his neighborhood. Concerns over bike-sharing and equity were raised earlier. In 2016, TransFormCA and the city of Oakland organized a community event called Oakland Mobility 101, or “OakMob 101,” which was an effort to obtain feedback from East and West Oakland residents about potential barriers to bike-share access. According to Hernandez, the city and Motivate chose to concentrate Oakland’s bike locations in the downtown area due to feedback from a community-mapping exercise, which showed that residents were primarily interested in using the bikes to get to their downtown jobs. Hernandez added that building bike stations in “far out-reaching areas” would be difficult and not useful to the community as a transportation option. Brytanee Brown, a community planner for TransFormCA and one of the individuals involved in OakMob101, stated that the East Oakland communities left out of the bike-share program are historically underserved by the city, especially when it comes to quality food, housing, and transportation. Expanding bike share to Deep East Oakland is the next step, however, according to Dani Simons, communications director for Motivate. The focus now, though, will be on making sure the current bike-station rollout has a smooth start. At the moment, there are no plans to build stations east of High Street, but Simons said that such an expansion would take less than a few years. The GoBike rentals cost $3 for a single trip, $9.95 a day, and $149 for an annual membership, unless you qualify for the low-income discount.